L.E.D – ActiveDark.com – Glowing Ideas! L.E.D. is the common abbreviation for a ‘Light-Emitting-Diode‘. An L.E.D. is a semi-conducting device that produces light when an electrical current flows through it. An L.E.D. consists of a chip of semiconducting material treated to create a structure called a p-n (positive-negative) junction. When connected to a power source, an electric current flows from the p-side (anode) to the n-side (cathode), but not in the reverse direction. Charge-carriers (electrons and electron holes) flow into the junction from electrodes. When an electron meets a hole, it falls into a lower energy level, and releases energy in the form of a photon (light). L.E.Ds were first developed in the 1960s but were used only in indicator applications until recently. The electronics industry has been using LED technology for several decades as indicator lights for various electronic devices. In more recent years, LED technology has progressed to the point where it is viable for general lighting applications and gained mainstream recognition as a primary portable light source. How do L.E.Ds emit different colors? The specific wavelength or color emitted by the LED depends on the materials used to make the diode. Red LEDs are based on aluminum gallium arsenide (AlGaAs). Blue LEDs are made from indium gallium nitride (InGaN) and green from aluminum gallium phosphide (AlGaP). “White” light is created by combining the light from red, green, and blue (RGB) LEDs or by coating a blue LED with yellow phosphor. Where have L.E.Ds been used in the lighting industry? L.E.Ds are commonly used in aesthetic, effect, or specialty lighting applications, including architectural highlighting. Most traffic lights and exit signs, for example, now use L.E.D. technology. 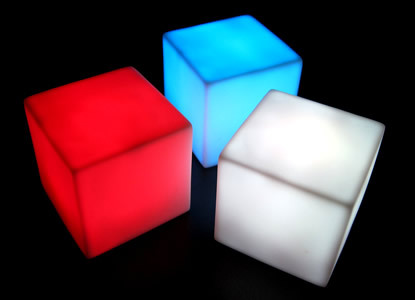 L.E.D lights are also common place in almost all home electronics, toys and novelty items. Christmas lights are becoming popular in an L.E.D. variety and many cell phones and handheld electronics use L.E.Ds due to the lightweight, limited power drain and non-heating properties. 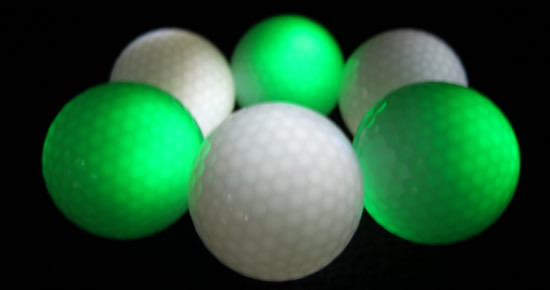 L.E.D lights have made portable and battery operated lighting much more affordable to manufacturer resulting in improving products such as battery operated lamps, flashlights, light wands and even new and fun applications such as light up sports balls and flameless candles! Have L.E.Ds always been used in general illumination lighting? No. Early attempts to apply L.E.Ds in general illumination lighting failed because they didn’t meet the lumen-per-watt output or color requirements. Technology has now advanced to the point where using L.E.Ds for general illumination is viable. Lighting industry experts are gaining a better understanding of how to capitalize on that technology. What are the advantages to using L.E.D. lights? L.E.Ds bring several advantages to the lighting industry, including high efficiency and durability, and, with superior life over other lamp sources, their required maintenance is greatly reduced. This translates into energy savings, maintenance savings and an overall reduction in cost of ownership over the product’s lifetime. Do you have to replace L.E.D. diodes? An L.E.D. does not burn out like a ordinary lamp, so individual diodes do not need to be replaced. Instead, the diodes gradually produce lower output levels over a very long period of time. If one L.E.D. fails, it does not produce a complete fixture outage.